Outside of the of popular 90s Disney animated movies lies one of the most dark, human, and honest feature films created by the "squeaky clean" production company. The most adult themed content found in other rated G Disney pictures were subliminal and immature sexual allusions. 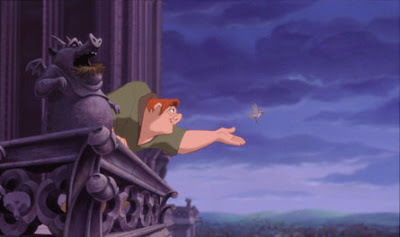 In the Hunchback of Notre Dame, issues of superficial, racial, and religious prejudice are brought out to the forefront for the audience to contemplate. 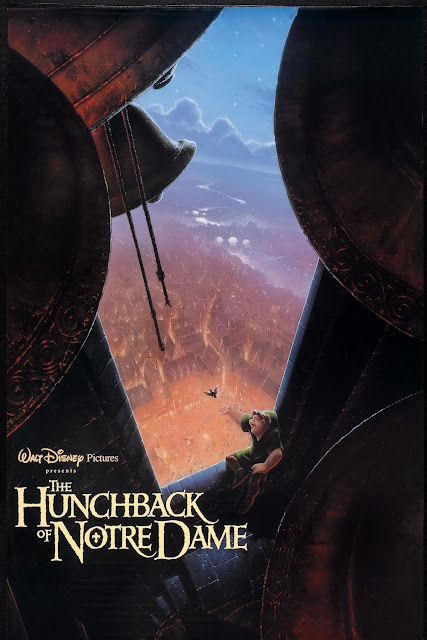 A government minister named Frollo accidentally kills the mother of a deformed child on the steps of the Notre Dame church. The priest of the church witnesses the incident and forces Frollo to raise this child, who he names Quasimodo (meaning "almost the standard measure" of a human). Quasimodo grows up confined to the bell towers, never getting the chance to meet or interact with anyone other than Frollo. Frollo tells the hunchback how he is too ugly to ever be cared for by anyone else. Things take a turn for drastic change when Quasimodo wanders down to the festival of fools, temporarily mistaken as another costumed attendee. He is soon discovered when someone attempts to pull off his mask but finds out it's his face on stage. The friendly crowd starts to turn on Quasimodo. They tie up, ridicule, and throw food at him. It was only by the mercy of the beautiful gypsy dancer, Esmeralda, who frees him. This enrages Frollo, who sets out on a witch hunt for all gypsies. If it wasn't for the goofy gargoyle characters to lighten up the mood every so often, the world this picture inhabits is quite bleak. Frollo orders the genocide of gypsies because he cannot deal with his lust for Esmeralda. Frollo tries to drop baby Quasimodo down the well before he is caught by the priest. The locals of Paris are portrayed as a fickle mob: in one moment cheering on Quasimodo for who he is, then turning, laughing and ridiculing him moments later. Towards the back end of the movie the people of Paris are again swayed by one speech to revolt against their own officials. Must they always listen and believe whoever is on stage speaking? What ultimately sets this apart from other Disney films the most is that the main character doesn't get the love interest in the end. 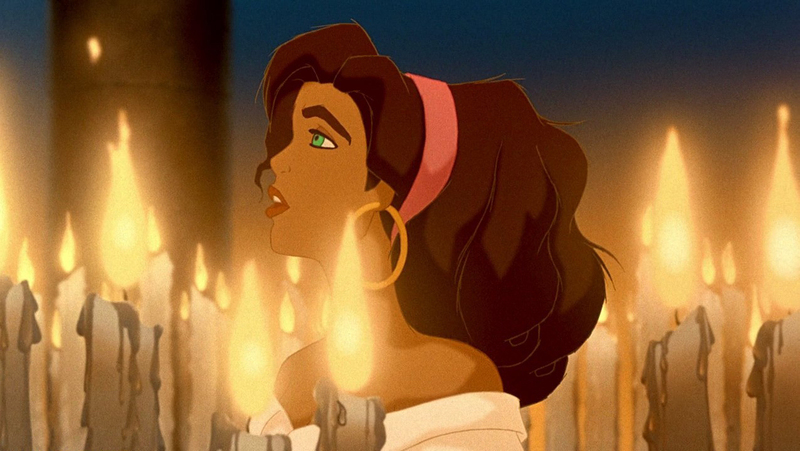 Was he only cared for by Esmeralda out of pity? Leave it to Disney to tell kids that saving the day doesn't get the girl. You have to look handsome too. The Hunchback of Notre Dame is available for stream on Netflix.